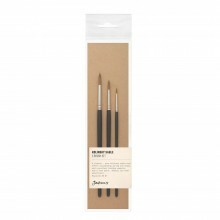 Jackson's Icon brushes represent the advancements of science combined with the classic needs of the traditional watercolour artist. A mix of tradition and modern technology, these Icon brushes represent the advancements of science combined with the classic needs of the traditional watercolour artist. The uniqueness of the Micro-Synthetic fibre is twofold. Firstly, the fibres are treated to produce millions of tiny indentations. 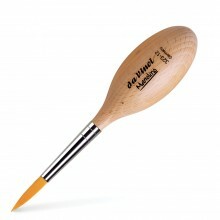 This increases the surface area of the hairs allowing a much greater colour holding capacity for the brush. The hairs are then treated with a special process that frees the micro-synthetic fibres of any static electricity which makes brush fibres stick together. Following this treatment the hairs can smoothly and precisely react to any kind of stroke, either delicate or abrupt. By then mixing natural sable hairs we create a brush that behaves like a pure sable but at a fraction of the price. 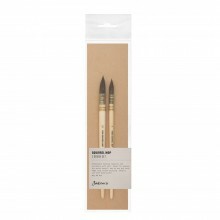 For more information about Jackson's Icon Watercolour Brushes, click here.